William R. Patterson is an internationally recognized wealth coach and business coach who has been a featured guest on over 300 television and radio programs. He is a two-time award-winning lecturer and national best-selling co-author of "The Baron Son." William is ranked as the #1 Business Motivational Speaker by Ranking.com. He is also winner of three 2008 Web awards including Best Speaker, Best Male Author, and Best Wealth-Building Site. 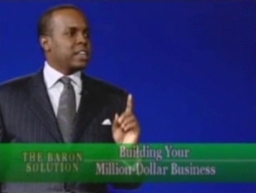 #1 Business Motivational Speaker and best-selling author William R. Patterson shares his BARON Wealth-Building and Entrepreneurship Strategies as a featured speaker for the Congressional Black Caucus Foundation 2008 Annual Legislative Conference. Other notable attendees include best-selling authors George C. Fraser ("CLICK") and Farrah Gray ("Reallioniare"). 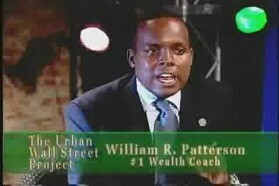 Wealth Coach William R. Patterson Receives Award from U.S. Post Office and Teach Boys & Girls Success, Inc. Wealth Coach William R. Patterson delivers the keynote for the 2008 National Family Empowerment Conference in Charlotte, NC where he is awarded a certificate of appreciation from the U.S. Post Office and Teach Boys and Girls Success, Inc. for outstanding community service during the unveiling of the national heritage Latin Jazz Stamp. Teach Boys And Girls Success, Inc. was founded in 2006 by CEO Donna Reed to help address the challenges of at risk youth through financial management and entrepreneurial training. "We have made great strides in improving the success rates of small businesses, but we are also committed to youth programs and community service," Patterson says. The Baron Solution Group has developed a national K-16 curriculum to help students in urban schools and teen mothers develop entrepreneurship and personal finance skills. We are proud to announce that BaronSeries.com has been nominated for six 2009 Black Web Awards. Please take three minutes to click the individual category links below to cast your votes now. The Baron Solution Group is an award-winning training, wealth coaching, and business consulting firm for executives, entrepreneurs, and investors. 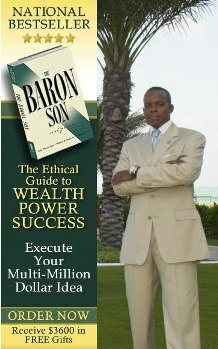 The Baron Solution Group was founded by William R. Patterson, D. Marques Patton, and Vicky Therese Davis, co-authors of the national best-selling business and personal finance book, The Baron Son. Their ethical guidebook to wealth, power, and success has been translated around the world and featured in the Forbes Book Club and Black Enterprise magazine. Wealth Coach William R. Patterson (CEO of The Baron Solution Group) and Earl Christian III (Executive Producer of The Urban Wall Street Project) have joined forces to create the BARON Young Millionaires and Producers Program. The program teaches an integrated suite of entrepreneurship, personal finance, and film production skills to students of all ages to help them to become the next generation of young millionaires. The Baron Solution Group is operating in one of the most difficult financial and political environments in over two decades. Yet Patterson and his team have been able to increase the revenues of clients twenty percent on averageâ€”and in some instances, double revenues in less than one year. Patterson achieves these results by applying the firm's proprietary method, which includes over 200 business and financial accelerators. By helping clients scale their businesses, Patterson has also positioned them to raise millions of dollars in private equity funding. Black Enterprise praised Pattersonâ€™s work, calling it "a compelling way to reveal how wealth-building strategies apply to everyday living." Patterson has also received endorsements from notable business leaders such as billionaire Founder of Black Entertainment Television, Bob Johnson, management expert, Tom Peters, and Chief Marketing Officer of The Nasdaq Stock Market, Inc., John L. Jacobs. "Many small businesses are in dire straits as a result of losing access to capital or are simply looking for realistic and ethical ways to accelerate their success. We are just glad to be able to help people," Patterson says. "We work so hard at what we do, because of our passion to help people transform their lives." William R. Patterson was recently honored during the Founder's Day celebration for Sigma Gamma Rho Sorority, Incorporated for his work teaching financial skills to students in urban schools and teen mothers. "We have made great strides in improving the success rates of small businesses, but we are also committed to youth programs and community service," Patterson says. He conducts The Baron Solution national youth workshop series to help children develop financial and business skills that are not taught in schools. He also developed a personal finance and entrepreneurship curriculum for Kâ€“16 students. 1. Where were you born and raised? Did you attend college or formally study the craft of writing? If so, where? I was born and raised in Hyde Park, a culturally diverse neighborhood on Chicago's south side. The broad range of people I came in contact with growing up heavily influenced my thinking and approach to writing. I learned there were common challenges that everyone experienced and by providing solutions to these common challenges, I could turn my passion for helping and teaching others into a successful business. I studied electrical engineering at Howard University and later went on to work for several Fortune 100 firms where I received advanced training in marketing communications, writing sales copy and effective written communication. Later, I launched a number of my own companies which have included publishing businesses and consulting firms where I have been writing books, articles and sales copy for the last eight years. 2. What would you like attendees to know about you, your background, or strengths that is not included in your bio? BaronSeries.com recently won three 2008 Black Web Awards including Best Male Author Site; Best Wealth-Building Site; and Best Lecturer, Speaker and Workshop site. We have a full support system for authors and publishers to help them dramatically improve their odds of success and earnings. At BaronSeries.com, we offer authors and writers coaching and consulting services for every aspect of copywriting, book concept development, publishing, marketing, and subsidiary and foreign rights sales. 3. When did you realize that you had a passion for writing, publishing, etc.? I have always had a passion for writing because there was always a message that I wanted to convey, even as a little kid. My passion for writing is really a reflection of my deeper desire to help others. I also love writing as a medium because of the longevity, leverage, and potential impact of the work. I can write something once and positively affect the lives of millions of people around the world for generations to come. As we discuss in our book, The Baron Son, passion if harnessed appropriately is one of the most powerful forces there is. I always encourage people to make it a priority to become business owners and investors either through their passions or while pursuing their passions. The power of true passion combined with sound business and financial practices can make anyone wealthyâ€”in every sense of the word. 4. Who are authors that have influenced you? Being an entrepreneur first, I am influenced most by business and self-improvement writers. I have learned a lot from people like Robert Kiyosaki, Mark Victor Hansen and Jack Canfield, who contributed to our best-seller campaign for The Baron Son. Robert has sold more than 26 million books worldwide and spent over 300 weeks on the New York Times Best Seller list. He taught me that when it comes to selling books, being able to effectively market and brand your work is actually much more important than your writing. Mark Victor Hansen and Jack Canfield, co-creators of the Chicken Soup for the SoulÂ® series, have sold over 100 million books worldwide and continue to make international publishing history with 148 titles in 45 languages. They taught me how to leverage others to produce marketable works quickly and also how to garner a great deal of publicity for my writing. They said one of the keys to their success was doing an interview every day. I took that to heart, and I have done over 300 television and radio interviews that have helped put The Baron Son on several national best-seller lists. 5. How did you master the topic you'll be presenting at BWRC? I have been writing professionally for over 15 years. I started out as a teenager doing freelance articles for magazines and newspapers. Next, I moved into writing marketing copy for Fortune 500 firms and small businesses. I later found worldwide success by creating and marketing The Baron Series line of books, audio CDs and other related material. Each step of my journey has prepared me for the next opportunity. Looking back, I now see how all the pieces fit together and how my experiences set the stage for my accomplishments as an author and writer. I have had years to figure out what works and what doesn't, and I look forward to helping others shorten their learning curve. 6. If you were to describe your upcoming sessions/presentations in one word, what would it be? 7. Who are your sessions particularly suited for? I will conduct two workshops at BWRC: Writing a Nonfiction Book that Sells and Writing Effective Promotional Copy. Whether attendees are new or seasoned writers, THE BARON SOLUTIONâ„¢ strategies will help them leverage their time, money and resources to maximize profits and returns. On top of invaluable planning and writing insights, attendees will learn an integrated financial model that any author or writer can follow to build wealth. In the workshop, Writing a Nonfiction Book that Sells, authors will learn a step-by-step process to quickly complete a bestselling nonfiction book. They will learn the many things they need to do before their books are published to become successful. Even individuals who may have nonfiction books that have been out for years will learn strategies that can give their books new life and generate additional income. In the workshop, Writing Effective Promotional Copy, I will share the â€œ11 Rules of Effective Copywritingâ€� that will help attendees achieve better results in one-third of the time. Whether writers are branding their companies, penetrating new markets, promoting an event or selling products or services, they will learn how to generate greater interest, responses and sales through promotional copy. They will learn secrets for becoming well-paid copywriters by developing the skills to move any audience to action. There are many workshops that can help attendees become better writers or authors, but there are few workshops that can teach attendees how to really make money and build a successful business as writers or authors. Unless they learn how to effectively plan, develop a product and service line, brand, market, generate publicity and sell, they and their work will be viewed as commodities undifferentiated in the marketplace and unworthy of special attention or extraordinary compensation. I will show attendees how to avoid common mistakes; establish their credibility; and leverage industry best-practices, turnkey solutions, and value-added resources. This information will help them to achieve larger profits and to grow and stabilize their publishing and writing businesses. There are high costs for authors and writers who do things the wrong way and who don't have mentors and coaches. If writers and authors intend to make a living in publishing, missing either course will cost them tens-of-thousands of dollarsâ€”or more. 8. At what other writers' conferences have you presented a session? I usually do 20-30 speaking engagements a year, in addition to coaching, teleseminars and webinars on writing and book publishing. BaronSeries.com features a detailed itinerary of events I usually attend. I am always teaching in the U.S. and abroad, and I encourage students to send in their feedback and success stories. I love sharing them with others. 9. What advice would you give to someone who has never attended a writers' conference? Take a few moments to write down your objectives for attending the conference and each workshop. This will provide you with a game plan, prevent you from wasting time and ensure that you accomplish what you intended to at the conference. In addition to the valuable strategies that you will learn from presenters at the event, you should use conference time to get answers to questions that are often not addressed in books. If you are unable to attend a specific workshop due to a conflict, check to see if the presenter has products, services or an e-mail newsletter that covers what you missed. You might even get additional insights on the topic. To achieve high-level success as an author or writer, you will need some type of mentoring, coaching and continuing education, so keep an eye out for instructors who may be offering those services. Last but not least, during your downtime, network with other authors and writers. Realize 80% of your success as a writer will be the result of soft skillsâ€”your ability to network, form mentoring relationships, strategic partnerships and joint ventures. 10. What are some projects you have in the works? Are there any in particular you'd like us to look out for in the near future? We have a BARON Personal Coaching Program which helps writers develop and market their work. We are guiding a number of upcoming authors through building their brands and creating international best-sellers. Also, my co-authors and I are working on the next installment in The Baron Series which will be geared toward women. The Russian, Portuguese and Korean versions of The Baron Son will also be launching in '08 and are expected to do well. In addition, we are now negotiating the rights to our screenplay, CUFFLINKSÂ®, a financial drama. 11. What is one piece of advice that you'd give all aspiring authors? Writing is a business; treat it like one. To be successful, it will take coaching, vision, planning, a strong network, investment, training, commitment and sacrifice. When it comes to achieving your writing and publishing goals, having a coach is one of the best investments you can make. You can more than double your chances for success by having a coach who can help you plan and who can hold you accountable for making measurable and sustained progress toward your goals. I spend over $15,000 a year on training just in the areas of effective communication, marketing, publishing and copywriting because I know the training will yield dividends six times over. 12. What is something you wish more writers understood about being an author and publisher? Cost-effectively marketing your books and products is often times just as hard, if not harder, than creating them. Marketing Baron P.T. Barnum said, "Without publicity a terrible thing happens...nothing!" The same is true for writing. The idea of â€œIf I write a great book, it will sell itselfâ€� is absurd. If you can afford it, hire an outside publicist. Having one frees up your time to do other important things such as develop new content. A good publicist will also have relationships that can make things happen for you a lot quicker. I would also encourage new authors to take advantage of every marketing opportunity regardless of how small. You have a short window of opportunity to make your book successful, so use it to the fullest. Lastly, look for creative ways to market your book and for other author, product or service tie-ins. We highlight this type of â€œAllied Effort,â€� that ultimately creates greater value for everyone, as a â€œSupreme Principleâ€� in The Baron Son. Award-winning lecturer William R. Patterson shares wealth-building lessons from the most successful Black entrepreneurs throughout history from the first female millionaire, Madam C.J. Walker, to the first African-American female billionaire, Oprah Winfrey. He discusses the strategies that built the early multi-million-dollar empire of A.G. Gaston and the billion-dollar empires of Reginald Lewis with TLC Beatrice International, John H. Johnson with Johnson Publishing, and Bob Johnson with BET. Learn from their successes, so that you may mark your own place in history. William R. Patterson is CEO of The Baron Solution Group, a coaching and training firm for executive leaders, entrepreneurs and investors. He is a two-time award-winning lecturer and national best-selling author. His breakthrough book, The Baron Son, has been translated around the world and featured in the Forbes Book Club and Black Enterprise magazine. William is an internationally recognized business authority who has been a featured guest on over 300 television and radio programs. William's website, BaronSeries.com, is ranked as the #1 Business Motivational Speaker Website by Ranking.com and is also winner of the 2008 Black Web Award for Best Wealth-Building Site. Long & Silverman Publishing, Inc.